This chapter considers the importance of informal carers in enabling patients to remain at home towards the end of life, providing extensive hours of care and covering a range of caregiving tasks, including physical, emotional, and social care and monitoring. It highlights the considerable impact that caregiving has mainly on carers’ psychological health, but also their general wellbeing, and it reviews the evidence on factors that predict worse impact, key elements of which are carers’ own appraisal of their situation and their preparedness. The chapter describes how carers occupy two main roles: that of a co-worker and of being a client themselves, and the main areas with which they need support to enable them to support the patient as co-workers, and to look after their own health and wellbeing as clients. It reviews the limited success interventions for carers have had to date, some of the challenges that need to be overcome, the importance of individualized, person-centered interventions, and some of the assessment tools that may help facilitate tailored support. It also highlights that assessment in itself is unlikely to be of benefit without clear procedures for discussion of and response to identified problems. 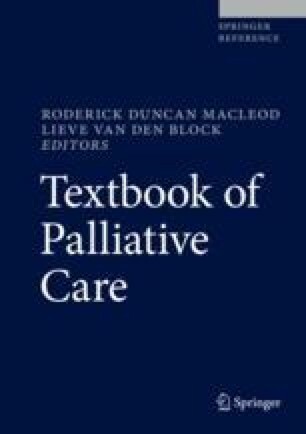 Finally, it considers factors required for implementation of carer support within palliative care practice, including procedures for identifying carers, recording carer data and for intervention delivery, as well as organizational level support to sustain implementation including leadership, staff training, protected time, and carer champions. However, fundamental to achieving consistent carer support is the question of whether carers are true clients of palliative care services. Buckner L, Yeandle S. Valuing Carers 2015 – the rising value of carers’ support. Carers UK. 2015. https://www.carersuk.org/for-professionals/policy/policy-library/valuing-carers-2015. Candy B, Jones L, Drake R, et al. Interventions for supporting informal caregivers of patients in the terminal phase of a disease. Cochrane Database Syst Rev. 2011;15(6):CD007617. https://doi.org/10.1002/14651858.CD007617.pub2. Carers Australia. The economic value of informal care in Australia in 2015. 2015. http://www.carersaustralia.com.au/storage/Access%20Economics%20Report.pdf. Last accessed 25 June 2018. Department of Health. Palliative care funding review: funding the right care and support for everyone. 2011. https://www.gov.uk/government/uploads/system/uploads/attachment_data/file/215107/dh_133105.pdf. Mitchell G, Girgis A, Jiwa M, Sibbritt D, Burridge L. A GP caregiver needs toolkit versus usual care in the management of the needs of caregivers of patients with advanced cancer: a randomized controlled trial. Trials. 2010;11:115. http://www.trialsjournal.com/content/11/1/115. National End of Life Care Programme. Reviewing end of life care costing information to inform the QIPP End of Life Care Workstream. Whole systems partnership. 2012. http://www.thewholesystem.co.uk/docs/EoLC_QIPP_Costings_Report.pdf. Neuberger J, Guthrie C, Aaronvitch D. More care, less pathway: a review of the Liverpool Care Pathway. London: Department of Health; 2013. https://assets.publishing.service.gov.uk/government/uploads/system/uploads/attachment_data/file/212450/Liverpool_Care_Pathway.pdf. Last accessed 22 June 2018. Office of National Statistics. 2012-based National Population Projections (Released: 6 November 2013). London: ONS; 2013. [Online] Available from: http://www.ons.gov.uk/ons/rel/npp/national-population-projections/2012-based-projections/stb-2012-based-npp-principal-and-key-variants.html. Romanow RJ. Building on values: the future of healthcare in Canada. Commission on the Future of Health Care in Canada. 2002. http://publications.gc.ca/site/eng/237274/publication.html. Last accessed 25 May 2018.